Overview: Sulawesi is one of the larger islands of Indonesia and the world's eleventh largest island, distinctively formed by four large narrow peninsulas. The Gulf of Tomini separates the northern Minahassa peninsula and East Peninsula. Scattered throughout Central Sulawesi along the Gulf of Tomini are a number of people groups whose languages are classified as Kaili. 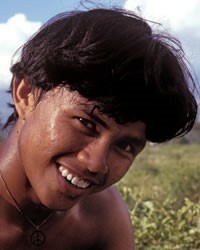 These groups, the largest of which is the Kaili Ledo, form the Kaili-Tomini of Sulawesi people cluster.